Haryana Congress stalwart Bhajan Lal has resigned from the post of PCC President to protest against the party high command ignoring his nominees while drawing up the list of members for the PCC executive. “I write this letter to you with a very heavy heart”, Mr Bhajan Lal said in his resignation. The WTO talks here collapsed today as Trade Ministers of 60 key countries failed to arrive at a common ground on agriculture and industrial tariffs and Commerce Minister Kamal Nath pulled out of the meeting. Is there a case for raising bus fares in Punjab? 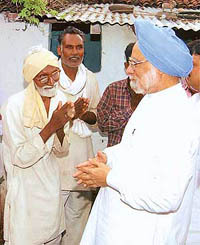 Prime Minister Dr Manmohan Singh today unveiled a Rs 3,750 crore package for Vidarbha, including loan waivers and rescheduling of agriculture credit. According to reports from Nagpur, Dr Singh said Rs 712 crore in interest to co-operative credit societies would be waived while loans amounting to Rs 1,300 crore would be rescheduled over 3-5 years with one year moratorium on repayments. While certain TV channels reported tonight that the Punjab Medical Entrance Test (PMET) paper leaked and nearly 18 persons have been rounded up in this connection in New Delhi, a senior functionary of the Baba Farid University of Health Sciences denied that any paper has been leaked. A Lieutenant Colonel accused of molesting an NCC cadet faces trial by a general court martial. The Review Assessment of Trial, ordering trial by the GCM, was issued by Headquarters, Western Command, three days ago. At least 20 persons were injured here this morning when the police burst teargas shells and resorted to baton charge to disperse demonstrators carrying the body of a youth, allegedly killed by security forces at Khayam Chowk last night. The POTA court today awarded death senten- ce to three persons for terror attack on Akshar- dham temple in 2002. 29 devotees, 2 National Security Guards commandos and two state commandos were killed and 81 injured in the attack.